Now available at a special sale price, discover how easy it is to get fit and stay in shape with the Total Gym XLS bodyweight training equipment! 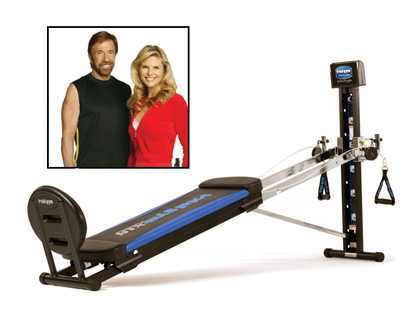 This universal home gym comes complete with a total fitness system of workouts and tools to take all the guesswork out of getting into shape. With this top-line home model you’ll receive the highest quality gym with unbeatable savings. Order the Total Gym XLS now to reach the level of total body fitness you’ve always wanted! Low impact, safe, complete back support. Pilates and resistance training DVD workouts available. Home Use: Lifetime on Frame, 2 Years on Moving Parts. Frame & Rail Construction: Chrome-plated upper rails. Black powder-coated lower rails. 1 1/4” x 2” steel tubing. Unit Weight: 82 lbs. / 37 kg. Board Upholstery: Non-tear vinyl covering. Foam Padding: 1.5” (3 cm)high-density foam. Resistance Levels: Six Levels 26 degrees, ranging to 6 degrees and 6% to 54% of body weight. Storage Capabilities: Rails fold into ladder & rollers on base to enable easy storage. Fits under most beds. Home Use: Warranty 12 months on frames, 6 Years on Moving Parts. NOT warranted for commercial use.